After our team of landscape designers has created the outdoor space you’ve always desired, we then begin a detailed and thorough landscape preparation process to ensure your installation is performed quickly, correctly and with great attention-to-detail to guarantee a lovely and high-quality landscape design. Throughout the entirety of your landscape preparation, we have a skilled and organized project manager overseeing every step and who has been involved with your landscaping project since the beginning. We utilize a sophisticated project management system to efficiently communicate and ensure the installation is highly-managed and sticks to the agreed-upon timelines. Your project manager works closely with you to keep you informed of all developments, provide detailed information about the current landscaping status and quickly answer any questions you may have. Our large and efficient crew maintains a strong sense of professionalism throughout the entire landscaping site preparation process, using advanced tools and equipment like backhoes, dump trucks and skid-steers to properly and quickly clean the space and clear away any debris or large objects. At the end of each work day, we take the time to ensure your property is clean and organized to meet our high preparation and workspace standards. Rough grading is the process of sculpting your space to a desired level and slope to provide proper drainage. Our team works with your existing land structure and uses the best tools and equipment to rough-grade the space, giving you a well-sculpted property and allowing for easy maintenance and guaranteeing an attractive finished product. If your design requires it, we then begin installing an intricate irrigation system. 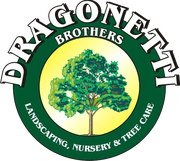 At Dragonetti Brothers Landscaping, our team stays up-to-date with the latest irritation technologies and trends for better, more successful and more eco-friendly watering in pots, planters and inground planting areas. We specialize in designing water-wise turf irrigation and water-wise plant drips that require minimal maintenance and are customizable to fit your needs and schedule. With these irrigation techniques, you’re guaranteed more effective watering practices and ensuring your water is being used conservatively. As a necessity for just sitting and enjoying your space or for entertaining and dining, hardscaping in your landscape design will help develop an outdoor living space while adding dimension and a bold statement. Hardscaping installation is the final step before plant installations and lets your landscaping design finally begin taking a recognizable shape. After cleaning, rough-grading and irrigation installations, our skilled team will then install all hardscaping features of your design, including walkways, paths, garden walls, patios and decks. Once the structures of your garden and landscaping have been completed, the interesting and more visual aspects of the design begin to take shape. The same project manager will be available to you to help with communication and coordination throughout this final step. Planting your customized plant selections takes much less time than the construction parts of the project and, with some designs, can take less than a day — transforming your space into a wonderland you can enjoy every day. Create a stunning and inviting new landscape design in your New York home or property with the help of Dragonetti Brothers Landscaping. Located in Brooklyn, we specialize in one-of-a-kind design and landscape preparation in Brooklyn, Manhattan and Queens. With over 40 years of experience, we guarantee outstanding craftsmanship and an exceptional customer experience. Contact us today at 718-451-1300 or complete our online form to schedule a free consultation or to speak with one of our specialists.